The Arab Spring was about cutting ties with an often harsh authoritarian past, what happened on the 21st of September 2012 in Benghazi, is about nothing less than the future direction of the Arab people. 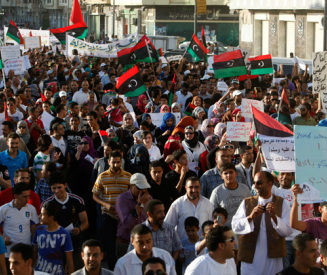 On Friday thousands of Libyans marched on the streets of Benghazi in support of their democratic rights. The goal of the Islamic militia of Benghazi was crystal clear; they sought under the force of arms to coerce the people of Libya into accepting the establishment of a strict Islamic state, and the militias would become the enforcers of Sharia law under the new Islamic regime. The Benghazi militias' ties with the Muslim Brotherhood, Hezbollah, Hamas, al Qaeda and a host of other radical Islamists groups is well established. These were heady days for the members of the militias, they were shipping captured arms from the poorly secured Gaddafi regime's arsenal to Syria by way of Muslim Brotherhood connections long the desolate Turkish/Syrian border region. Arms from Lybia, especially missles, were used by the Hamas government of Gaza to shell southern Israel, and to topple the goverment of Mali. The coup de grâce, however, was the stroming of the American Consulate in Benghazi, this was to be the badge of honour for the radical Islamic militia group to show that they had the power to contorl events, and by implication the pleople of Libya. This would have made Libya a safe haven for the radical Mullahs and Imams whose message gives holy legitimacy to such carnage. After the events in Beruit where some 100,000 chanting marchers answered the call of the radical Hezbollah chief Hassan Nasrallah flooded the streets on the 17th of September, the militias of Benghazi must have expected similiar sceens on the streets of Libya following prayers on Friday the 21st of September. On Friday the 21st of September tens of thousands of Libyans took to the streets to rally against the radical Islamist militias and stormed the headquarters of the main militia group in Libya's eastern city of Benghazi, the Ansar Al-Sharia militia, pulled down their flags and torched the facility. Earlier that same day, protesters had also entered a separate compound belonging to the militia and destroyed it. It is fitting that Friday's protest should have taken place in the same city that became the epicenter of last year’s uprising against Muammar Gaddafi’s regime. And, it should be evident that toppling an authoritarian leader in North Africa or the Greater Middle East does not neccessarily result in trading an autocracy for a theocracy. “I don't want to see armed men wearing Afghani-style clothes stopping me in the street to give me orders,'' a university student who took part in the sacking of the Ansar Al-Sharia militia's headquarters, remarked to a reporter from the Associated Press, "We want the central government to disband all the Islamist militias and also condemn the attack on the US Consulate that killed four Americans, including Ambassador Chris Stevens." What the Hezbollah rally in Beruit carefully staged into two lines of protesters, one male and one female, and the re-emergence of their chief into public view was supposed to demonstrate that the radical Islamist forces were clearly in control of the agenda of North Africa and the Greater Middle East. His re-appearence was staged on the cusp of a sucessfull raid on a US Consulate and scores of angry protests at American Embassies throughout the Arab world. However, what emerged in Benghazi just four days later was a protest by 10's of thousands of Libyan citizens, male and female marching together carrying signs promoting democracy and calling for the complete disbanding of all the Islamist militias. The people of Libya could see the direction the radical Islamists were taking them and rejected it. They could also see that what had seemed a week earlier to be all powerful Islamist militia forces, were in actuality just a small band of armed men with an agenda to control them with ideas of God's will enforced by the gun. The leaders of the Muslim Brotherhood, Hezbollah, Hamas, and al Qaeda will have to re-think the hold they imagined that they had over the Arab people and the ability of small bands of heavily armed men to enforce their view of how people must live in the 21st Century. The veil of all-powerfulness having beeen lifted their control seems very vulnerable these days. There has been much said about who should have done what, and who should have known what, after the storming of the American Consulate in Benghazi in which four Americans citizens died, especially by the two contenders for the top job in Washington. There has been no mention, however, of the wisdom of the Transformational Diplomacy strategy of former Secretary Rice, or the fact that this Congress saw fit to shut down the Voice of America radio broadcasting service which could have given a voice to citizens like those who stormed the militias headquarters in Benghazi in the name of democracy. The next president of the United States will face a daunting international agenda. And, to meet that challenge will have to put our diplomatic house in order, and the first thing that must be done is to dismantel the failed policy of 'smart diplomacy' which our current president and Secretary of State have embraced rather blindly. The thin veil of all-powerfullness having been lifted from the facade of radical Islam bodes well for the future of the Arab world. The phrase ... and the glow from the fires of Benghazi will trully light the Arab world, is not quite what the radical Islamist leaders had in mind when they called out the faithful to protest. What was set aflame on the streets of Benghazi were the fires, the eternal flame of liberty which cannot be extinguished.